Ffinally... (see yesterday) Maybe it was just me, but was that not the longest-short week ever? 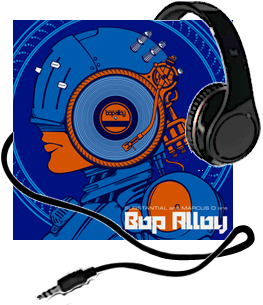 Bringin' it home to quitting time this week is Bop Alloy , the collaboration between Baltimore rapper Substantial and Seattle producer Marcus D .
This Rap style brings me back to that classic era Long Island/Queens sound from Tribe and De La Soul that has kept hip-hop-heads bouncing for over 30 Years. The beats are sick, the rhymes are great and whole album sounds like it should be listened to with a snifter of brandy in hand. Take whatever you've been working on, put it to bed and get out there and enjoy your weekend.